Tagged CSR, garbage, India, Landfill, Mumbai, New Delhi, New York, Recycling, Solid Waste Management, Solid Waste Management in India, solid wastes, Urban Wastes, Waste-to-energy. Bookmark the permalink. Integrated Solid Waste Management is a responsibility of each and every individual, as it benefits all as a part of the society and the environment. Also, it is practically not possible to do it without the community participation, along with government and corporates. We need to focus on a strategy for managing this issue by developing industry wise models, as industries differ in the type, situation and resources for the waste and its management. Like, my focus is on hospitality sector which is a major contributor of organic waste in the landfill besides the household. As a Fulbright scholar from India, I am working on the hotel waste management at Penn State University, Pennsylvania. I have found that though there are many similarities, but waste management in hotels need different strategies for India and USA. The type of waste generated differs a lot, plus the regulations and laws are so different, In US hotels need to pay to throw (haul) their waste, but in India hotels are paid to throw (haul) their waste. Thus, industry wise models may be developed to control this menace. Second thing which may bring quick change and adoption is education. 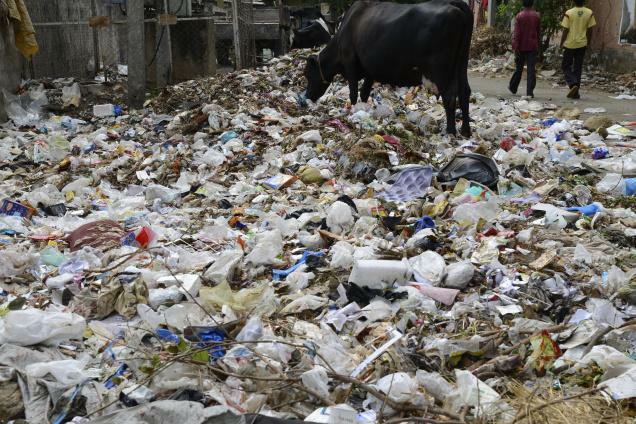 People are not much aware about the issues and drastic consequences of climate change and waste management in India. There is not much effort in this direction. A quick solution is to make solid waste management as compulsory part of education at various levels, starting from schools to college. Also, It should be taught to practice in schools, which can bring sudden improvement in the overall thinking and practice as it happens in US. Waste segregation is a kind of addiction (for good cause), once kids learn to segregate trash before throwing it in the dustbin, it is much more likely that they follow it forever. People who do it, agree that it becomes almost like a second nature to them. Dr. Nirpendra, yes you are right. I agree with everything you said. Community participation – public awareness (of not just climate change, but also public health impacts and environmental degradation – read “Solid Waste Management – India’s Burning Issue” on this website) – education – policy and regulations are all important. this matter is amazing…………… it provided me great help to complete my assignment……. all thanks to Ranjith sir…………. Glad to know that Ranjith’s article helped in your assignment. An Integrated Solid Waste Management Plan must be in place and implementation for developing and underdeveloped countries of the world, MSW is a resource for development and growth if it’s taken seriously and properly managed by every individuals, Local municipality and National government policy and implementation. The MSW sustainable management in developing countries is suffering from political lip service. Is always good when we think how to close the loop in a circular economy but we should make sure our facts are factual. In one of you article I just saw you talked of 0.5 kg per capita and here you talk of 3 million per year. Where do you see “3 million” in this article?